When I first began reviewing this show eleven years ago, it was a mid-winter adventure, often requiring near-heroic driving skill either coming or returning home to Rochester, New York. This year, with the show scheduled for mid-April, it should have been different, but the specter of a huge nor�easter arriving Sunday shrouded the event with an air of concern. The dark and dank weekend seemed to have an effect on the numbers of visitors, too. This was unfortunate because in its second year at the Sheraton Centre downtown, it was very well organized, and much better advertised than ever before. For the most part, the listening rooms were spread out sufficiently to avoid major interference. This also had the effect of thinning out the crowd, making it easier to get around on the upper floors. Overall, the quality of the presentations was very high with only a small handful of rooms that were truly disappointing. Perhaps the cost of participation has become a barrier to smaller or less successful manufacturers, but there were some significant critically acclaimed companies missing as well. At least one I know of had skipped this show because a major new product was not yet ready for introduction. Two major glitches confronted us as Linda and I cruised into Montreal on Saturday morning. There were no banners on the Sheraton Centre proclaiming the presence of the show. In fact, I dropped Linda at the curb to run in and scout out the location. 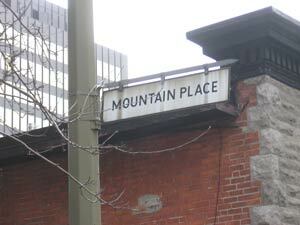 Once I was assured we were at the right place at the right time, I drove up the hill to find a parking space. Montreal has graciously provided special parking accommodations for off-road vehicles. The second glitch was the descent down two flights of stairs in the hotel to buy tickets, or in our case, obtain passes. Linda was sore from over-exercising earlier in the week. Perhaps more obviously handicapped visitors were directed to elevators by the Festival staff that was reasonably plentiful. The up-side of the downstairs registration was that everyone was exposed to the subterranean rooms. The first of these contained one of the Best Rooms systems. Out of respect for the varying room limitations, I choose to highlight �Best Rooms� as a class of outstanding presenters rather than pretentiously giving 1st, 2nd, 3rd awards that could be the luck of the music selection or the number of bodies absorbing sound when I happened to be in the room. Rather than start at the bottom, we returned to the main floor where Linda treated me to a Starbucks coffee � straight black, no cream, no sugar. We sipped coffee all the way up to the 11th floor and through half of the rooms we visited there. The Gershman Acoustics room was right off the elevator where their flagship Black Swan loudspeaker was driven by Simaudio electronics fed by a Weiss digital front end. Quite unusual, all the electronics were sitting directly on the carpeted floor, seemingly without the benefit of any footers or vibration absorbing devices. Very un-tweaky. It sounded quite good at this show, but my curiosity to hear this speaker driven by a tube amplifier goes unsatisfied. Oh, well, perhaps the impedance dips too low. 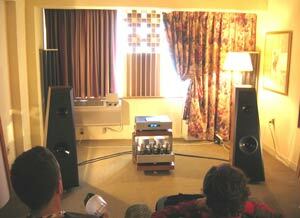 Next door was another Gershman room where they were premiering their new Sonogram loudspeaker, a $2500/pr. CN rectangular floorstanding tower that sounded very nice regardless of the price. The finish was quite unusual � a hand-painted finish that at casual glance appeared to be wood. Closer inspection revealed that it was not. The big secret, however, was on the inside, where an internal pyramid eliminated parallel walls, no doubt contributing to the very respectable sound. A dome tweeter and a dome midrange driver combined with a coned woofer designed by Gershman in this 3-way design that supposedly goes down to a low of 28Hz. In the primary Mutine room the music began in a C.E.C. TLO-X transport ($18.9K CN), a uniquely designed and very handsome unit feeding a Audiomat Maestro DAC that fed into an Audiomat Recital integrated amplifier ($14.9K CN) which powered Equation 35 loudspeakers with pure ceramic tweeters and midranges and a very fine Birdseye maple light finish. But before we heard this outstanding rig, we were treated to a mini-lecture by Pascal Ravach who brought the Mutine philosophy to light in terms that could be understood even a novice in this pursuit. Mutine is a rather strange and unique entity, being in the position of both distributor for other select manufacturers and manufacturer of their own products. Exploration of their involved website will both confuse you and enlighten you � the two are not mutually exclusive. Lest you think they live completely in the stratosphere of the High End, Mutine had a second room with more modestly priced product that sounded nearly as wonderful as their big rig. 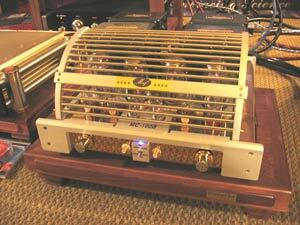 A Mimetism 20.1 CD player connected to a Mimetism 15.2 integrated amplifier at $6900 each. Mimetism bills themselves as French creativity with Swiss precision. The Atlantis Acoustique Argentera loudspeakers here were priced at $11,900/pr. CN. Sometimes it is the non-playing pieces on exhibit that evoke the most interest from me. Two examples showed up here in the Mutine rooms. 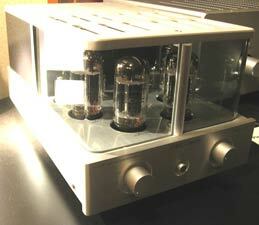 The first was the C.E.C Classic integrated tube amplifier that exhibited very interesting architecture at $3290 CN. And seemingly naked without a tonearm and cartridge was the Pluto Audio turntable, available by special order only at $15,590 CN. Even more intriguing was word that Mutine will be manufacturing the new David Berning line, which is very near completion. While prices are yet to be determined, let�s say they are somewhere between $6K and $10K US. In the Niro room I found this very heavy duty LCD corner mount that is just what you need for mounting your new TV in the corner of your bedroom where it can be seen above your twinkling toes. This is one of the beefiest units I�ve seen, though an additional interface is required if you need to add tilt. The Hearld loudspeaker, looking like a descendant of the B & W Nautilus of days gone by, generated quite a buzz at the show that was amplified by the fact that its location was not listed in the program. It was very nicely finished and was priced at $6300 CN with a threat to go to $7K at Christmas. 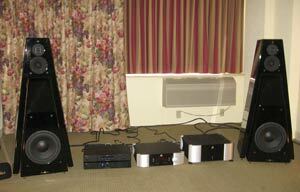 Three different amplifiers were on stands between them, so what you heard may have been different than what I heard. There was a silver Kallisto tube stereo amplifier with what looked to be 300B tubes, an Aoin stereo integrated amplifier, and a Maf Audio MC-100B tube amplifier with switchable input sensitivities on the face where the single ended inputs were mounted. 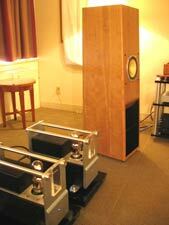 All three amplifiers were on beautifully finished wood stands by Elemente. From my brief exposure to this room, I suspect this loudspeaker is an outstanding value, particularly if it is as efficient as the 300B tube amplifier suggests. I also suspect there is a long waiting list for review samples, judging from what I heard and the enthusiasm of the visitors in the room. The Hearld certainly ranks very high on the "Look-at-me" vector. Robert LaMarre of RL Acoustiques was smiling with good reason when I walked in. 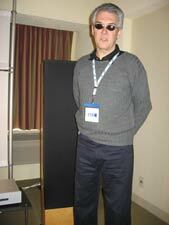 His Lamhorn 1.8 loudspeaker with AER Mk 1 drivers ($8500 US) were singing better than I have heard them in years. While the single driver horn speaker was pretty much the same as ever, the Norvinz marketing people had backed it up with a very fine supporting cast including a Merrill Scillia Research MS2 turntable ($10K US), Vacuum State SPV1 preamplifier and Phonostage ($5K CN), and Opera Audio Cyber 211 single ended monoblocks putting out 16 wpc ($5500/pr US). While the music playing did not suggest this system is for head-bangers, it certainly displayed finesse. The Aurum Acoustics room sounded wonderful, as usual. I noted the engineered burl veneer on the speakers that comes from renewable wood forests. While not as striking as some exotic wood veneers, it befits the class of audible quality and it is eco-friendly. The $50K integrated system easily retains its Best Rooms recognition, but as presented with Crystal Cable, it took a jump to $65K. The little circular wood widgets beneath the speaker spikes are a Marc Philip design from inovaudio. They also make very clean looking contemporary racks and diffusers, as well as the rack for Aurum Acoustics. The Ferguson Hill room was both an eye and ear opener. Their FH007 Mini System has arrived a mere 35 years too late to be featured in Stanley Kubrick�s futuristic film, A Clockwork Orange. The translucent acrylic speakers, with a horn mounted tweeter and a sphere mounted mid-woofer actually sounded pretty decent. The shelf-mounted rig, complete with active crossover and amplifier comes in at $1195 US, with a powered subwoofer bumping that up another $595. There are four channels in the amp, rated at 16 wpc. The first 1.5 watts are Class A; the rest A/B. Thus, each horn and mid-woofer driver has its own power channel. Interestingly, the amplifiers were transconductance types that modulate current rather than voltage, which allows the horn drivers to extend out to 20kHz. 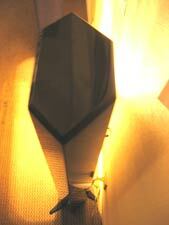 But even more interesting was the MSB Technologies modified iPod with music encoded with Apple Lossless format. MSB has in effect cracked the iPod code, allowing for their iLink System to send the digital signal to their Link DAC III (24bit/192kHz), bypassing the inexpensive analog stages of the iPod. The system also includes an RF remote. Pretty cool and pretty cool sounding, too. The MSB gear, however, adds another $2500 US, plus digital cable to the overall cost. Tara Labs cables added additional cost and quality to the sound, no doubt. There was also good music from more traditional gear in a room featuring a Creek CD player and a Funk Firm turntable, which was, indeed, very adorable. This table has received some good press, so it was interesting to see it in person. It looks to be technological finesse rather than real high quality materials and workmanship doing the trick. Unfortunately, the CD player was in use when I came through and the room was a little chaotic with people milling around. The loudspeakers were the little ERA Design 4 Satellites ($749/pr. CN) that sounded and looked very nice. I suspect the Nordost ribbon speaker cables cost more than the monitors, however. If you�re looking for a surround sound/home theater system, ERA puts together packages that range from $2430 to $5500, complete with subwoofer. 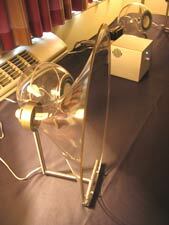 BC Acoustics had an interesting hexagonal loudspeaker based on their A1 model. This hexagonal floorstander goes for $2500 CN in wood finishes, or $3200 CN in piano gloss black, as it was shown on silent display. It is designed to be placed close to the wall, a feature that will endear it to many who live in tight quarters, or have little people running around in their homes.